REGARDLESS OF WHETHER you’re talking about an athlete or a vehicle with a combustion engine, improving aspiration can make a tremendous difference to performance. Just as a runner trains at elevation to make breathing easier at sea level, helping a turbocharged vehicle breath easier will net horsepower gains. In the last Test & Tune installment, our 2011 WRX realized a peak gain of 18.48 horsepower with just an intake, exhaust and a reflash. In this segment, we continue to search for power and torque. 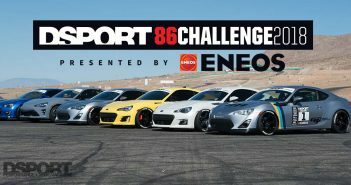 Thanks to broad aftermarket support, there exist a number of performance components that can further improve the EJ255 engine’s performance. Let’s see what a downpipe, intercooler and header will do for the Boxer engine. Our first objective is to make more power and torque by further improving the exhaust flow. Although gains in the WRX were made with an aftermarket cat-back exhaust, there was still a restriction in the exhaust to contend with. 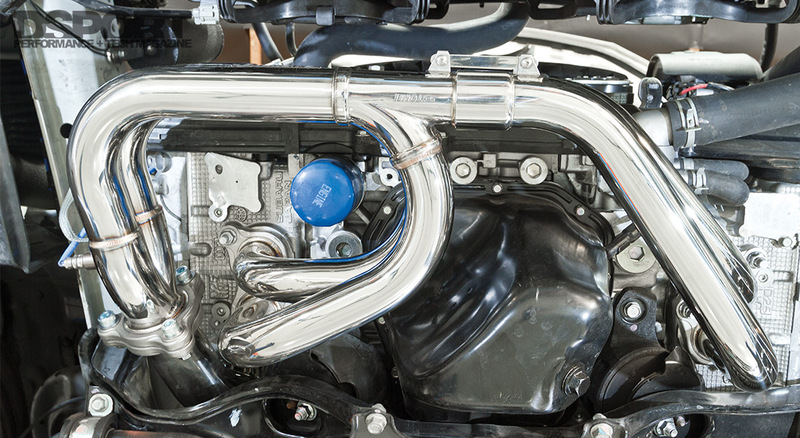 The factory downpipe ensures emissions compliance thanks to its inline catalytic converter. However, it also poses a bottleneck in the exhaust flow. To illustrate the benefit of a free flowing turbocharger, we turned to TOMEI Powered for a solution. The stainless-steel downpipe features a two-piece stainless-steel construction composed of 76.3mm piping with a slip fit joint for reduced weight. This downpipe weighs in at just under eleven pounds, less than half the weight of the stock unit. The next area of improvement was the intercooler. The stock unit sits on top of the engine, which has its benefits and drawbacks. On the up side, its not blocking any heat exchanging cores (like the radiator and condenser) at the front and is not as susceptible to damage by road debris. On the down side, the core is small and is subject to heat soak due to its location. Switching to a front-mount intercooler permits the use of a larger core that receives direct airflow for improved heat exchange efficiency and ultimately, a cooler, denser air charge being drawn into the intake ports. 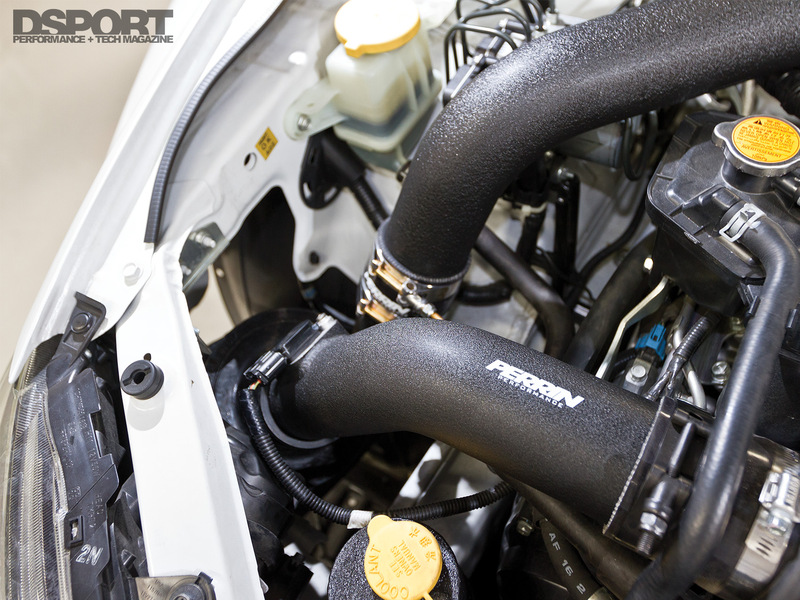 To this end, Perrin Performance’s Front-mount Intercooler System was chosen for the duty. This bolt-on kit includes all hardware and ancillary components necessary to facilitate a complete installation. Now that we’ve addressed the pathways leading away from the turbocharger, it’s time to address the path leading into the turbocharger. From the factory, the exhaust manifold features a cast iron, unequal-length, multi-piece design that adds weight and complexity to the plumbing that feeds the turbocharger. While the unequal-length manifold design helps with turbo response, it hampers peak power production. 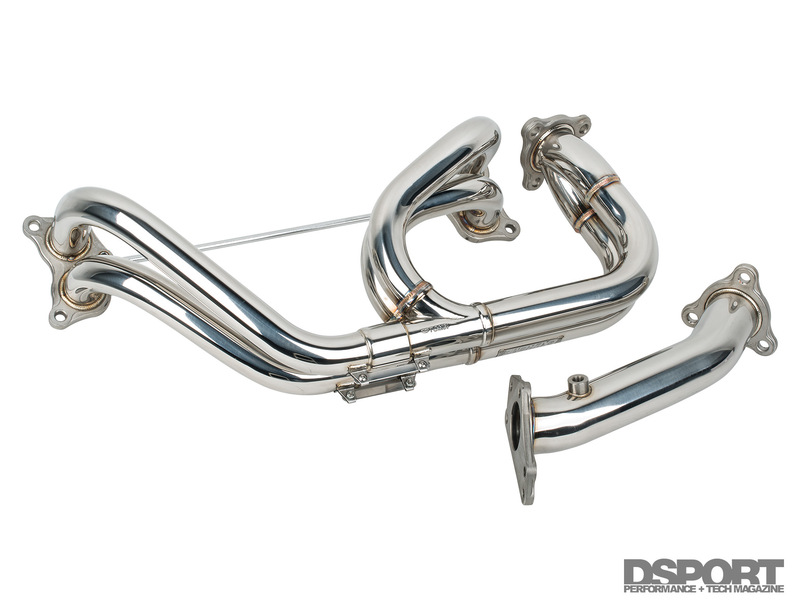 Instead, we chose TOMEI Powered’s stainless steel, equal-length exhaust manifold for the duty. This manifold features slip fit connections and TIG welded joints, complete with a lustrous mirror polished finish. Swapping out the downpipes on the WRX will typically take between two and three hours. You may need to modify a wrench to reach all of the bolts on the bellmouth of the downpipe at the turbocharger, as Subaru uses a stud with nuts on both sides to secure the downpipe. We took a box end wrench and ground it down until it was thin enough to fit around the nut on the turbo flange. 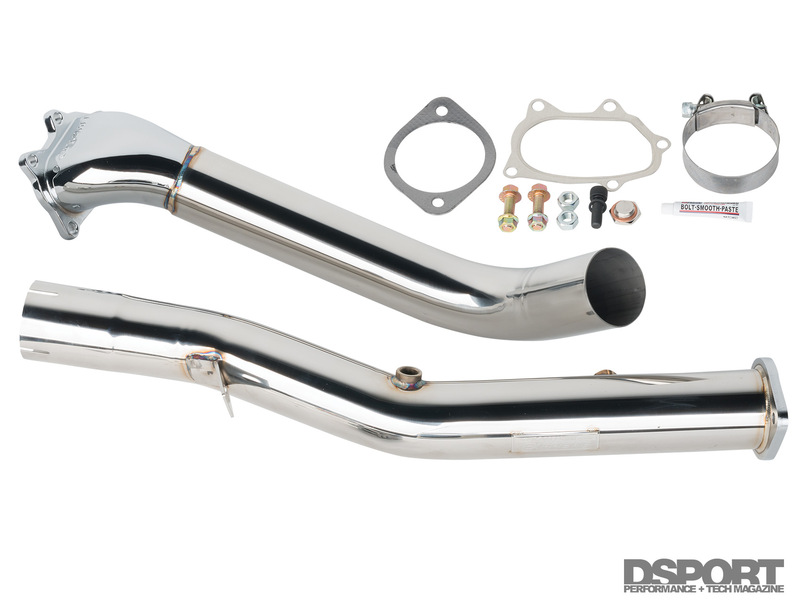 The larger diameter tubing and straight through cat-less design of the TOMEI Powered downpipe provides a more free flowing exhaust path leading from the turbocharger to the cat-back system. In conjunction with the downpipe install, we downloaded (from the Cobb Tuning website) a flash tune optimized for a bolt-on downpipe. On the dyno, the downpipe made measurable gains, increasing peak output by 15.75, to 289.28 whp. Horsepower gains on the WRX were observed from 4,500 RPM through redline, with the greatest gain of 29 horsepower noted at 6,600 RPM. While peak torque only increased by just shy of one lb-ft , noteworthy gains of up to 19 lb- were realized from 4,500 RPM through redline. The TOMEI Powered downpipe weighs a lot less than stock, and makes 15.75 more peak horsepower when paired with a Cobb AccessPort flash. The greatest gain of 29 horsepower occurred at 6,600 RPM. Keep in mind, this is a cat-delete pipe and is not street legal. 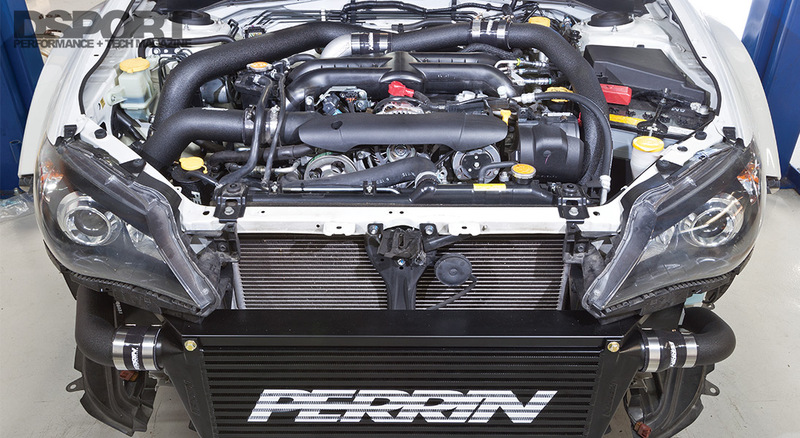 The Perrin Performance front-mount intercooler kit includes everything necessary for a complete installation. The black finish of the intercooler and piping make for a stealthy and “murdered out” appearance, very low key and unobtrusive. While the book time for the installation is estimated at approximately four hours, the actual installation time is closer to between seven and eight hours. The instructions are not as detailed as they could be, fitment isn’t as refined as we’d like and there is a lot of bumper trimming that must be completed for proper fitment and presentation. Note, if you’re using a Perrin Performance Intake system, it doesn’t fit well with this intercooler kit. We understand that Perrin is working on a solution to this issue. As not all intercoolers are of the same size or capacity, producing optimum output required tuning. Bill Knose of Delicious Tuning came over to Hard Media Inc. Headquarters to tune the WRX. Because of the cooler intake charge, Knose made adjustment to the fuel and ignition tables while observing intake air temps and the knock sensor. With peak boost pressure increasing by just over one psi, peak horsepower increased by 31.51 while peak torque checked in at 27.84 lb-ft . The intercooler helped the EJ255 realize power gains from 3,250 RPM through redline. The greatest horsepower gain (49 whp) and the greatest torque numbers (45.2 lb-ft) occurred at 5,700 RPM. 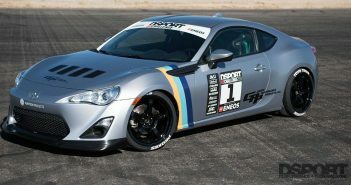 Although this kit comes to market a little on the expensive side, its performance gains are indisputable. 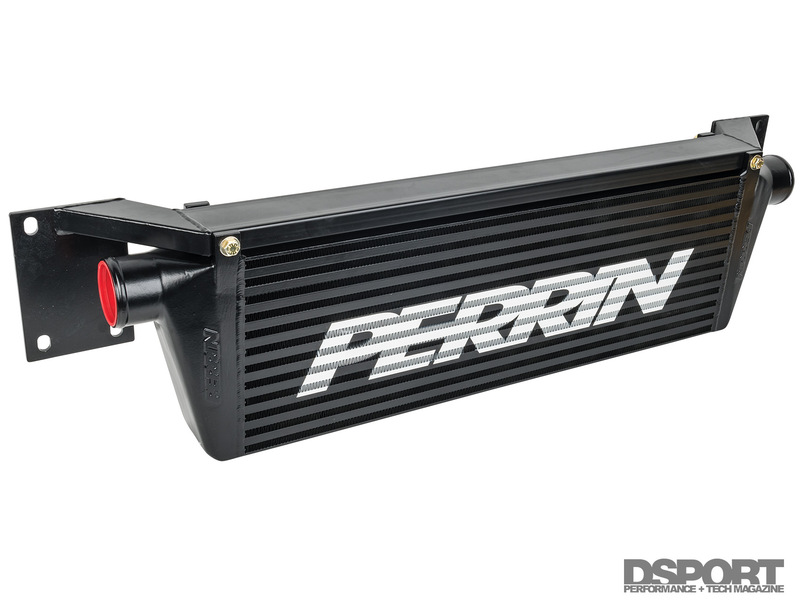 The Perrin Performance Front- mount Intercooler produced the greatest gain, raising peak power by 31.51 horsepower and realizing a maximum gain of 49 horsepower at 5,700 RPM. Bill Knose of Delicious Tuning adjusted the fuel and ignition tables using a Cobb AccessPort. Moving on to the exhaust manifold, expect to invest at least three to four hours for the installation. In order to remove the stock manifold and up pipe, it is necessary to drop the sub frame. 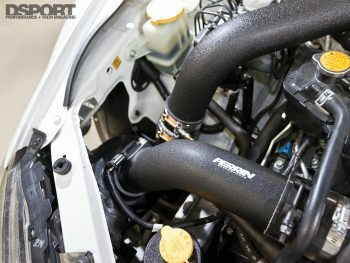 The TOMEI Powered equal-length manifold featured spot on fitment and a clean presentation. 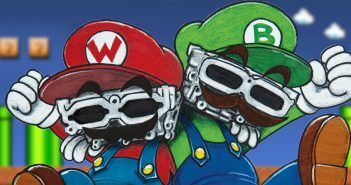 Although the unequal-length manifolds are generally considered to be more responsive, the mistimed exhaust pulses cause the engine to sound like its only firing on three cylinders. Proponents of this sound refer to this as the “Boxer engine rumble.” Equal-length runners do not suffer this condition, and since the exhaust pulses are channeled in order through the 4-2-1 manifold design, the turbocharger showed marked improvement on the dyno. After Knose optimized the tables once again by way of the Cobb Access Tuner so ware, the peak boost pressure actually dropped by 1.6 psi, yet the engine produced additional horsepower from as early as 2,250 RPM through 6,000 RPM. The broad RPM range and gains throughout o er usable power without any perceptible loss in response. The greatest horsepower gain of 35.4 and the greatest torque gain of 43.77 lb-ft both occur at 4,250 RPM. Peak power of 327.48 whp was noted at 5,970 RPM, while peak torque came in at 341.53 lb-ft at 4,200 RPM. The TOMEI Powered equal- length exhaust manifold with up pipe helped to increased power and torque production without any loss of response and without sounding like it’s running on only three cylinders. The downpipe, intercooler and manifold collectively added 53.95 horsepower, raising peak power figures to 327.48 whp. That’s a 19.7 percent leap in output compared to the previous figures that the WRX put up after the first Test & Tune segment. In the next installment, the WRX will get a fuel delivery upgrade composed of a pump and injectors. Then it will receive a turbocharger upgrade and a retune. When we started this Test & Tune session on the GVB WRX, the goal was to aim for the 340 horsepower mark on 91 octane fuel. 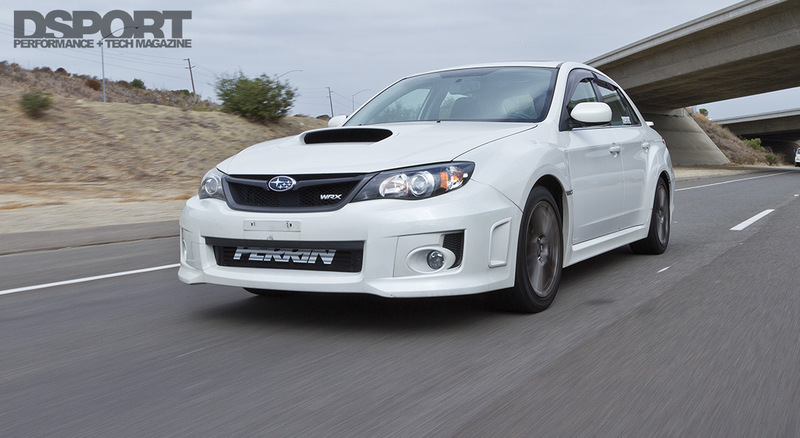 Without the turbo and fuel system upgrades, the WRX is only 12.5 horsepower from reaching its goal. The new question to ask is “How much will the WRX end up making?” Stay tuned.